Leading Manufacturer of electromagnetic drill stand and portable electromagnetic drill stand from Hyderabad. Our company is widely appreciated for providing Electromagnetic Drill Stand to the clients. This product is available in various technical specifications to suit the diverse requirements of the clients. Electromagnetic Drill Stand is manufactured by our professionals as per the set industry norms using high grade parts and with the aid of advanced machine. Offered range is widely acclaimed and demanded by our clients for various applications. Stand will not drop even during power failure. Electrical power is not required to keep the magnet ON. 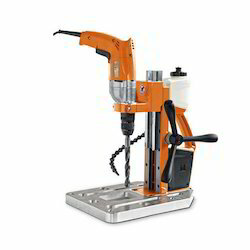 Various models of portable drills can be fitted using adaptor and fixture. Can position drill precisely by correct adjustment. Aluminium slides accurately machined and moves between brass guides. Also suitable for drilling of odd shaped jobs. Our company has been acknowledged for offering Portable Electromagnetic Drill Stand to the clients. This product is widely demanded among our esteemed clients due to several attributes such as sturdy construction, smooth operation and long service life and many more. Portable Electromagnetic Drill Stand is rigidly tested on various quality parameters by our skilled quality controllers to provide a defect free range in the market. 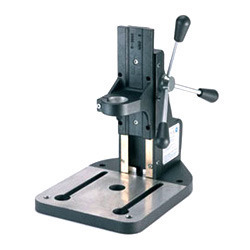 Looking for Magnetic Drill Stand ?